Amazon Price: $6.95 $5.95 You save: $1.00 (14%). (as of April 23, 2019 3:52 am – Details). Product prices and availability are accurate as of the date/time indicated and are subject to change. Any price and availability information displayed on the Amazon site at the time of purchase will apply to the purchase of this product. 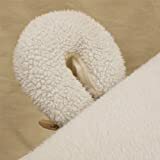 Add a layer of warmth and comfort with a thick luxurious Repose™ Fleece Face Rest Pad for your face cradle. Ultra-soft and durable 3/4" pile and beautiful faux-fleece texture make these a must for the ultimate in table comfort. These will easily fit under any face rest cover we sell.